:Did the Protestant Reformers understand Paul correctly? Has the church today been unduly influenced by Reformation-era misreadings of the Pauline epistles? These questions?especially as they pertain to Martin Luther's interpretation of the Pauline doctrine of justification?have been at the forefront of much discussion within biblical studies and theology in light of the New Perspective on Paul.But that leads to another question: Have we understood the Reformers correctly? With that in mind, these essays seek to enable a more careful reading of the Reformers' exegesis of Pauline texts. 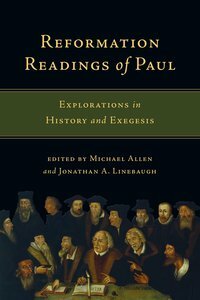 Each chapter pairs a Reformer with a Pauline letter and then brings together a historical theologian and a biblical scholar to examine these Reformation-era readings of Paul. In doing so, this volume seeks a better understanding of the Reformers and the true meaning of the biblical text. About "Reformation Readings of Paul"
Order now to secure your copy when our stock arrives. eBook is Available. 0 Available. Expected to ship in 5 to 6 weeks from Australia. ABN:93 001 583 759, and its content suppliers. ABN: 93 001 583 759, and its content suppliers. All prices are in Australian Dollars - AUD unless otherwise stated.